Dante Exum is a professional Australian basketball player of American descent. The point guard was selected fifth overall by the Utah Jazz in the 2014 NBA Draft straight from high school after having impressed scouts. He will be looking to emulate the successes of legendary players such as LeBron James, Kobe Bryant, and Tim Duncan who also entered the league straight from high school and were able to dominate the game for years. On the 13th of July, 1995, in Melbourne, Australia, Dante Exum was born to American parents who had emigrated to the country. At around the age of five, Exum was introduced to the game of basketball by his father and within a few years, he showed so much interest and advancement in the sport that the family began to think of it as a career choice for him. Exum was enrolled at Lake Ginninderra Secondary College in Canberra while he was playing as a junior in the Keilor Basketball Association. He also concurrently attended the Australian Institute of Sport during that time. In his senior high school year, Exum earned a participation in the Nike Hoop Summit. He played for the World Junior Select Team who beat that of USA. He then went back to school and helped Lake Ginninderra win the Australian National High School Basketball Championship in 2014. Following those exploits, a number of college programs were interested in bringing Exum over to the United States to attend college before eventually making it to the league. The player however decided against going to college and instead, decided to declare for the 2014 NBA Draft where he was selected by the Utah Jazz with the fifth overall pick. Dante Exum joined Utah for the 2014 NBA Summer League where he averaged 7.2 points, 2.6 rebounds, 2.8 assists, and 1.4 steals in 5 games. He then went on to make his debut in the Jazz’s season opener against the Houston Rockets where he contributed with 5 points, 1 assist, and 1 steal. He went on to manage a season-best 15-point game against the Milwaukee Bucks on the 22nd of January, 2015, and a season-best 12-assist game against the Denver Nuggets on the 1st of April, 2015. At the end of the season, Dante Exum averaged 4.8 points, 1.6 rebounds, and 2.4 assists in 82 games in his rookie year. At the beginning of the following season, Exum joined the Jazz for one game at the 2015 NBA Summer League before meeting up with the Australian national team. Unfortunately, it was during this time that Exum suffered an anterior cruciate ligament injury in his left knee that prematurely ended his season. Dante spent the whole of the 2015-16 regular season on the sidelines before returning for the 2016–17 regular season opener. He split his time that season between the Jazz and it’s NBA D-League affiliate Salt Lake City Stars as he was returning back to full form. He went on to average 6.2 points, 2.0 rebounds, and 1.7 assists in 66 games. In the 2017-18 season, Dante Exum suffered a shoulder injury that required him to get surgery. He spent the beginning of the season on the sidelines before returning in March 2018 with a 10-point effort against the Phoenix Suns. 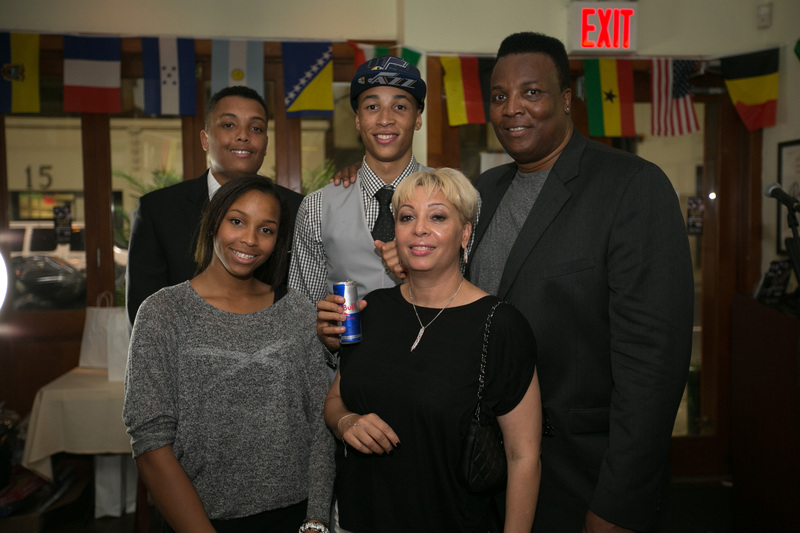 Dante Exum has as his parents; Cecil and Desiree Exum, to thank for his outstanding athletic abilities. Desiree was a high school track star who attended the University of North Carolina. His father Cecil, who also attended the same university, was a professional basketball player who first played college basketball under the legendary Taar Heels head coach Dean Smith and alongside Basketball Hall of Famers James Worthy and Michael Jordan. He was part of the team that won the 1982 NCAA Championship. After graduating in 1984, Cecil was drafted by the Denver Nuggets with the 194th overall pick but, however, never managed to play a game in the NBA. He later opted to move to Australia in 1989 where he got to play in the Australian National Basketball League for teams like the North Melbourne Giants, the Melbourne Tigers and the Geelong Supercats. In his 7-year NBL playing career, Cecil Exum averaged 10.7 points, 6.9 rebounds, and 1.8 assists per game. Today, both parents serve as very close advisers to their son who is looking to remind the world of the Exum family name. Another member of the family doing the same job is Dante’s twin sister, Tierra, who is said to be an international gymnast. The twins have an older brother named Jamaar. Dante Exum’s height is listed at 6 feet 6 inches or 1.98 m, making him one of the tall point guards to play in the NBA where the average height of players in that position is about 6 feet 3 inches or 1.93 m. His weight is further listed at 190 pounds or 86 kg.